Margin with discount combines the two together to give you a price tailored to the customer. 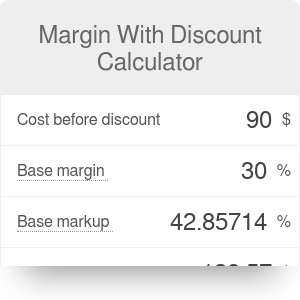 This calculator combines two common problems - sometimes you want to calculate your profit margin (or markup) and give the customer a discount at the same time. You buy blue widgets at $60 a piece. Usually, you work with a 40% gross margin, so it gives you a sale price of $100 (remember, margin is a ratio of profit to revenue, while markup is a ratio of profit to cost). This would give you a $40 profit, but a customer wants to make a really big order and you're willing to lower your price by 20% and sell it for $80. All things considered, your true gross margin is 25%. As with all our calculators, you may solve for any value - for example, you may start with the profit field and work your way up to find out how much you may pay your supplier (the cost). Margin With Discount Calculator can be embedded on your website to enrich the content you wrote and make it easier for your visitors to understand your message.